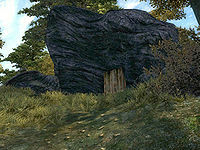 Shadow's Rest Cavern is a medium-sized cave northeast of Chorrol containing monsters. 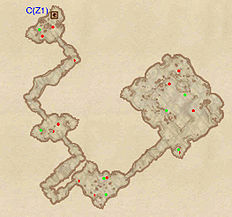 It contains two zones: Shadow's Rest Cavern and Shadow's Rest Rocky Run. This cave contains 7 Cairn Bolete plants and 10 Wisp Stalk plants. 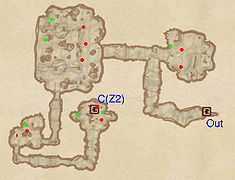 A guaranteed magic item, a Base Ring of Sneak, can be found near the cavern (map). There are a pair of waterfalls nearby. Looking at the waterfalls from the lake they feed into, go to the waterfall on the right and stand underneath it. The ring should be at your feet, either floating or resting on the bottom. 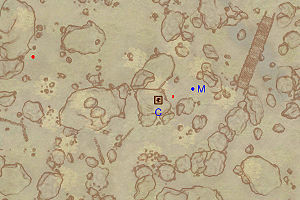 This location's map marker (M on map) is named Shadow's Rest Cavern (editor name ShadowsRestCavernMapMarker). The entrance door is WSW of the marker, 50 feet away. This zone is entirely linear, making it easy to explore although it contains quite a bit of enemies and only minor loot chests. From the entrance, proceed through the tunnel and check the northeastern room for a locked chest guarded by monsters. 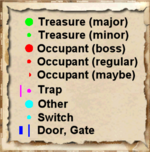 Head west to a similar room with more opposition and two chests, one of them locked. Head south through the tunnel and follow it around as it bends and you will land in a small room with more minor loot chests and a trapdoor at C, leading to Shadow's Rest Rocky Run. Upon entering from door C, get ready for an immediate encounter with two monsters then loot the chest. Like Shadow's Rest Cavern, this cave is linear all the way to the end, so simply make your way through the tunnels and locate the chests on the way (green dots on map), picking the locks where it is needed. In the final huge chamber, up to four enemies awaits, so proceed with caution and pry open the three chests they are guarding. Once you are finished, backtrack all the way back to door C and make your escape to the first zone. This page was last modified on 25 March 2018, at 03:12.